On Twitter today, Ice-T has made an important announcement sure to shake all Americans to their very cores: He has never eaten a bagel. He’s never eaten a bagel, and he’s also never had coffee. This information must come as a shock to Law & Order: Special Victims Unit fans everywhere, who know his character Odafin “Fin” Tutuola as a wise-cracking, perpetually astonished man of the people. Fin was born in Harlem, served in the U.S. Army Rangers, plays video games, exhibits casual homophobia before learning about his son’s sexuality, and who has managed, over the course of 20 seasons of the show, to avoid any kind of career advancement or precinct move that would force him to ever leave his position as a subordinate character on this show. Fin is the kind of guy who has absolutely eaten bagels in his life. Of course he has! And as one Twitter user points out, there is proof. “You had a cinnamon raisin one on SVU” is exactly the kind of damning lead we need to take down this implausible fact. Did he actually have “a cinnamon raisin one”? Let’s go to the tape. In this short but noteworthy discussion of the cinnamon-raisin bagel — a scene in which Ice-T, as Fin, holds a bagel the entire time — he never takes a bite. That bagel is pristine, a virginal unbitten expanse of smooth bagel exterior without even a hint of nibbling. Maybe he didn’t eat the bagel. Maybe, although we’re obviously meant to believe that Fin has eaten a bagel, Ice-T truly never has. Maybe he’s never had coffee, either! (Evidence seems strong that he has had iced tea, though.) This leaves us with so many questions. What else has Fin eaten on SVU? Has Ice-T eaten any of those things? What does he eat for breakfast, if not coffee and bagels? Why hasn’t he eaten a bagel? Has Mariska Hargitay ever eaten a bagel? Has Chris Meloni? Surely Richard Belzer has thoughts on this. Sadly, when Vulture asked for elucidation on these questions, Ice-T declined the opportunity to answer. “Thanks for your email but Ice is going to pass,” his rep responded. 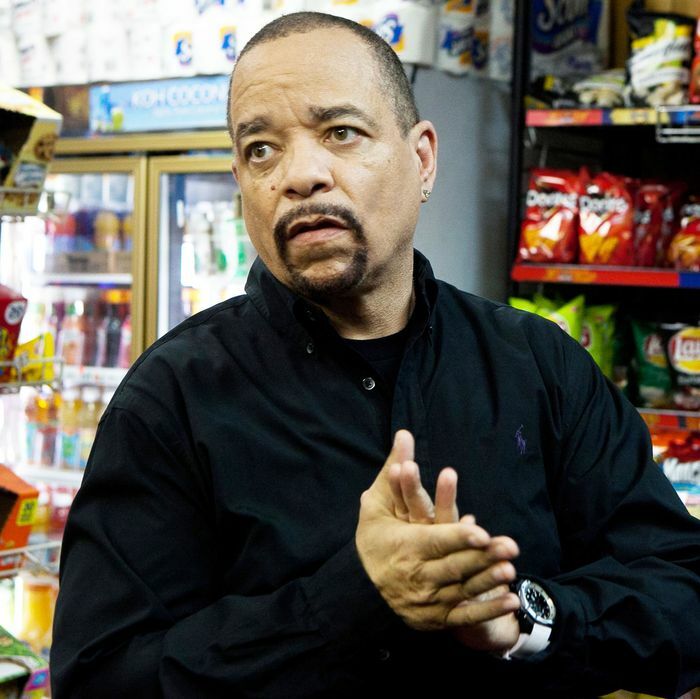 Update, November, 29: Last night on The Tonight Show, Ice-T elaborated on why he never ate a bagel until an SVU script directed his character to do so. “Why would I eat an unsweetened doughnut?” he asked host Jimmy Fallon. See Ice’s full comments on the very un-gangster nature of a ring of savory bread below.